With Master Z getting an American release on April 12th 2019 (and Ip Man 4 not too long after that), seems like a good time to go back and watch the original Ip Man trilogy. Donnie Yen was already riding high from SPL and Flashpoint and this film had me paying closer attention to the actor’s filmography. The film also thrust the titular character into the mainstream after its success and so the cinema machine started churning with other film makers hoping to profit on the popularity of Bruce Lee’s wing chun teacher. Now that time has passed and those imitators have mostly died down, the question now is, does Ip Man, the film directed by Wilson Yip hold up all these years later? Ip Man is a well renowned master of the martial art wing chun who lives a simple but well off life with his wife and son in Foshan. With that prestige comes challengers however as other fighters come looking for the master in hopes of gaining notoriety. Donnie Yen is extremely likable as the titular character and portrays this infallible fighter very naturally. The first 30 minutes of the movie has excellent pacing and goes by so quickly because of its story structure and how it cleverly writes fights into the plot. For martial arts enthusiasts, there are plenty of short but sweet scuffles scattered about and everything is clear to see with the wirework only enhancing the moves rather than drawing too much attention to it. Once the overconfident northern Chinese fighter, Jin comes to town and begins challenging all the martial arts masters, we’re treated to some nicely shot encounters that easily telegraph how strong and intimidating this fighter is. The story sets up a good cocky fighter that you want to see get taken down by Ip Man as the two finally square off with the entire town’s honor hanging in the balance. Guess who wins and gains the love and respect of everyone? Camera pan up to the sky. Cue dreadful music. The once vibrant and colorful town of Foshan literally has all its colors sucked away as the war begins, the Japanese occupy the city, and the Man family are now homeless, struggling for food. I’m fine with things slowing down to get a little more dramatic for our characters but it never really feels like Ip Man is having a real struggle for us to care about. Sure, the movie says he’s homeless but they’re clearly staying in a small apartment that’s probably bigger than my New York City home :P The movie also states that Ip Man is finally going to look for work to make money so that means that they’ve been living off some sort of income and getting by while others were really without nothing. It’s a little hard for me to sympathize as he’s also able to get work because of his past status and everyone who recognizes him still holds this wing chun master in high regards. Now that Ip Man is technically at his “low” point, the movie decides to introduce us to new villains, a Japanese general, Miura and his second in command, an on the nose caricature of a World War 2 Japanese soldier, Sato. They’re willing to pay Chinese martial artists with bags of rice for their participation in a “friendly” fighting tournament with other Japanese soldiers. It’s a pretty silly plot point but it works since there’s no other way into getting Ip Man fighting 10 men without him getting shot up afterwards. Speaking of fighting 10 men, if you do a Youtube search of “Ip Man”, this infamous fight scene will most likely be at the top but with good reason. As I mentioned earlier, Donnie Yen was never really on my radar before but after SPL, Flashpoint, and now this movie, he definitely was now. The speed of his 100-hand slap, (punch in this case) is incredible and could give E. Honda a run for his money. It really is a wonder to behold as he literally pummels one opponent to the ground. Now if you just watch that scene online without context, the editing is a little too choppy and it has one of my biggest pet peeves in fight scenes which is people waiting their turn before attacking someone. Ever since Jackie Chan pointed this out in one of his documentaries I now feel like no fight scene should have this glaring element. But all of that doesn’t matter so much because of this fight’s emotional placement in the movie. Prior to this, we see some minor characters who we met earlier in the film being killed during this tournament and one of them is suddenly shot by the trigger happy second in command Sato. Because the movie actually did a good job with making us like these small characters beforehand, we’re once again rallying behind Ip Man because you know he’s the only person with the skills to stand up to the Japanese. Despite my criticisms with certain aspects of this fight, it’s very satisfying to see Ip Man take out his anger on these men and heartbreaking that his fellow countrymen died over bags of rice. Oddly enough I laughed out loud however when Ip Man delivers a said bag to one of the killed Chinese fighter’s family and it still has the stains of his gunshot wound on it. Ip Man can take out a room of men with ease but doesn’t know how to read a room full of grieving loved ones. Oh and by the way! We’re also still dealing with the antagonist from the first half, Jin, who’s terrorizing a local cotton mill and demanding ransom after stealing their goods. I feel like this 3rd storyline should have been dropped completely and let us focus more on the struggles with the Japanese army. I guess we wouldn’t haven’t gotten the eye rolling scene of Ip Man teaching an entire factory line the art of Wing Chun though… I understand they were trying to turn him into the “hero of the people” but in the end, he still needs to come in and save everyone from the bandits anyway so what was the point? Now fast forwarding, the plot predictably ends with a fight between Ip Man and general Miura but it’s probably the most forgettable one in the entire film. There’s never any indication that Ip Man might lose because he’s pretty much a Chinese Superman, and he pummels Muira by channeling Wing Chun moves that intercut with him practicing on a traditional wooden dummy. It’s all a little too obvious but sure, why not? The movie then abruptly ends with Ip Man getting shot, the Chinese civilians rioting, and the Man family escaping to Hong Hong with titles cards finishing off by detailing the rest of the events. Oh and who could forget 3 separate zoom-ins to the family’s reaction of Ip Man getting shot. Another laugh out moment where it’s supposed to be played for serious drama. All in all, it’s a little too abrupt for my liking and thankfully only puts a slightly sour after taste on the film as a whole. 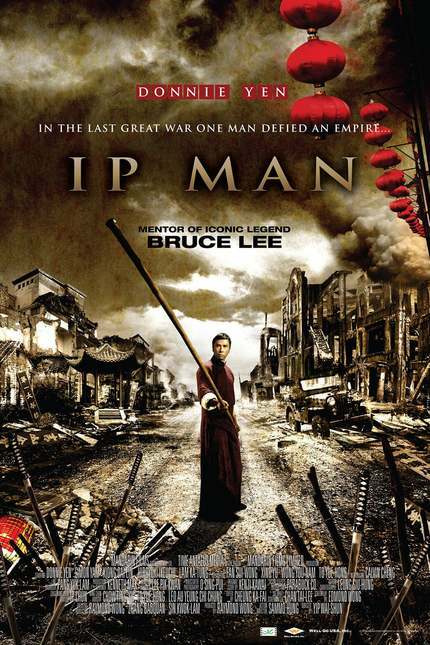 While I did nitpick many little things about the story, I really enjoyed revisiting Ip Man. For martial arts enthusiasts this a definite must watch. Donnie Yen’s almost unreal speed paired with Sammo Hung’s choreography created a lethal yet stoic hero that you can definitely get behind. With most of the same team behind this film returning for the sequel, there’s no way that film would be anything short of amazing, right? Zero lends his thoughts on martial arts to the Fists of Fail podcast and also creates drink along reviews called Only Nice Things.